Those looking for a last-minute gift can score big points with these giftable Staunton experiences. Far better than a sweater with a gift receipt, your loved one will love the special treatment you’re about to bestow upon them. It will be a happy holiday indeed! Indulge your loved one’s palate with a food tour of Staunton. While it’s certainly lovely to enjoy a meal in one spot, get creative with your very own dine around featuring a different course at various restaurants and of course GIFT CARDS. Start the evening with a fancy cocktail at Zynodoa, followed by a charcuterie board—they also have cheese plates—at Yelping Dog. For your main course try the signature sizzlers at the Depot Grill or the handhelds at Byers Street Bistro but whatever you do save room for dessert. Get a slice of pie at Firkin Pie or have your pick of delectable desserts at Paris Cake Company. And if you still have some room get a night cap at The Pompei Lounge. And remember gift cards are a PERFECT stocking stuffer! Bequeath the beer lover in your life with a Craft Beer Tour. Centered around the breweries of the Shenandoah Beerwerks Trail, Shenandoah Tours escorts you to the tastiest beverages of the season. And an added bonus get a FREE T-shirt once you’ve visited six breweries and received a stamp at each one through the Beerwerks Passport Program. Download Traipse, an app that guides you through the city uncovering places you might have otherwise missed. Along the way, pick up a few gift cards for thirsty friends on your list. With pen or brush in hand, your favorite budding artist will thrive during a Beverley Street Studio class. A variety of drawing and painting classes are available. Help the overworked mom or dad find a rejuvenating moment for themselves. The gift of a massage is widely considered to be one of the best gifts to receive. Contact Mill Street Body & Soul Day Spa for a gift certificate. Take in a High Tea for Two at Anne Hathaway Cottage Tea Room. Don your best hat and don’t forget the pinky finger. The tea experiences now feature four teas that were known to be thrown into the Boston Harbor during the infamous Boston Tea Party, as well as a Chocolate Tea that is attributed to Martha Washington. 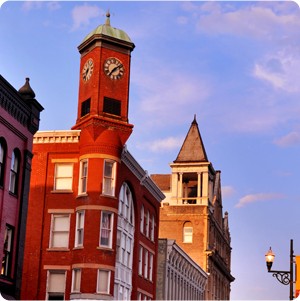 As one of the oldest cities west of the Blue Ridge Mountains, Staunton’s history spans three centuries. 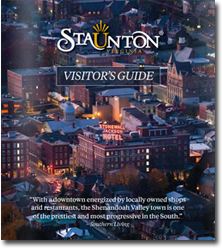 A wide selection of historic attractions, archival collections, old buildings, museums, and Civil War sites are located in and around Staunton. Get your history lover admission tickets to any of our must-see museums. “Dinner and a show” is one of the most common date nights in Staunton thanks to our thriving restaurant scene and the incredible talent displayed at American Shakespeare Center’s Blackfriars Playhouse. The Winter Wine Festival is coming up in February! Snag two tickets and book an overnight at the host venue, the Stonewall Jackson Hotel, all for one low rate. Get a bottle of wine to top it off at Ox-Eye Vineyards. Connect your hiker friend with a place to stay in Staunton, an excellent hub for nearby hikes like Humpback Rocks, Spy Rock, and St. Mary’s Falls. Hook ’em up with a gift card to Wilderness Adventure while you’re at it. That will score them goods for the trip. Another vantage point for an outdoor lover is to hit the Fields of Gold Farm Trail in the spring. Arm your friends with a gift card or two to help them patronize trail partners, and then top it off with another for a meal at Nu-Beginning, a farm-to-table hot spot in Staunton. We’re confident that whomever you’re shopping for will love a Staunton experience unique to their tastes. Let us know if we can help you identify other giftable experiences. Happy Holidays! 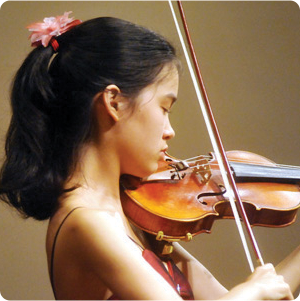 Staunton’s awe-inspiring churches are especially splendid during the holiday season with beautiful candle-lit windows, greenery, and of course, special programming. 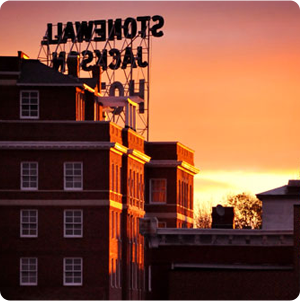 Here are a few reasons why you should make the drive to Staunton to take it all in. Staunton’s oldest church dates to 1746 and features 12 Louis Comfort Tiffany windows. Intricately crafted and dating to 1897, the windows include the Benedicite, The Archangel Michael, The Madonna and Child, The Praising Angel, The Good Samaritan, Easter Windows, Angel with a Script, and The Beloved Physician Saint Luke. The oldest, most prominent of the windows are The Ascension Triptych, a series of three windows centered behind the altar. The church is open to visitors Monday-Friday from 1 pm-4 pm. St. Francis of Assisi Catholic Church was the first major design by architect T. J. Collins, built in 1895. One of the most beautiful buildings in Staunton, St. Francis is a beacon for the faithful and those who love architecture. The parish website explains the architecture: “… the spiritual goal of Gothic revival architecture is to lead the beholder to mystically reach towards the heights of Heaven …” Collins called it “English Gothic.” Whatever anyone chooses to call it, we call it captivating. 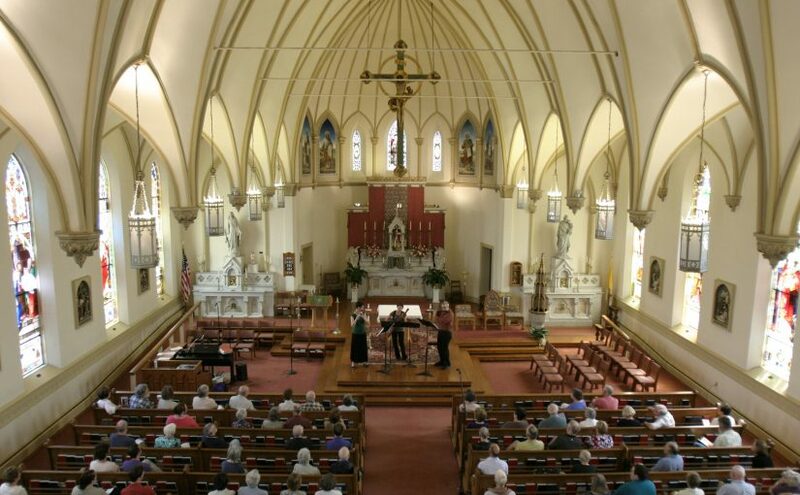 Before you come, take a virtual tour of the church to truly appreciate the distinctive architecture, stained glass windows, various church furnishings, and the liturgical excellence of St. Francis Church. – December 12: Advent Penance Service, 7 p.m. When you look upon the facade of First Presbyterian Church on Frederick Street, the first things you’re likely to notice are the three large entry arches and complimentary stained glass arch soaring above them. It’s an impressive sight. Historical tidbit: The 28th President of the United States of America was baptized in this beautiful church led by his father, Reverend Joseph Ruggles Wilson. That’s Thomas Woodrow Wilson, if you need a refresher. The church manse where Wilson was born is now part of the Woodrow Wilson Presidential Library and Museum campus. And here’s a fun fact: the basin used to baptize the would-be President of the United States is still in use today. Organized in 1865, Allen Chapel African Methodist Episcopal Church was the first church in Staunton and west of the Blue Ridge Mountains established by people of color. 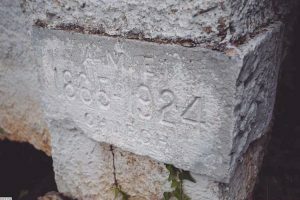 The church body met at various locations for a number of years until 20 members of the congregation secured the original 1868 building site at 921 West Beverley Street. In 1997, Allen Chapel A.M.E. Church moved to a more accessible location at 936 Sudbury Street. You’re welcome to drive past the original 1868 site, but it is now a private residence. Dive a little further into our beautiful downtown by getting to know our five historic districts. They’re all stunning during the holiday season and beyond. Consult the Calendar of Events to plan your next trip to Staunton and see our list of other holiday happenings taking place. 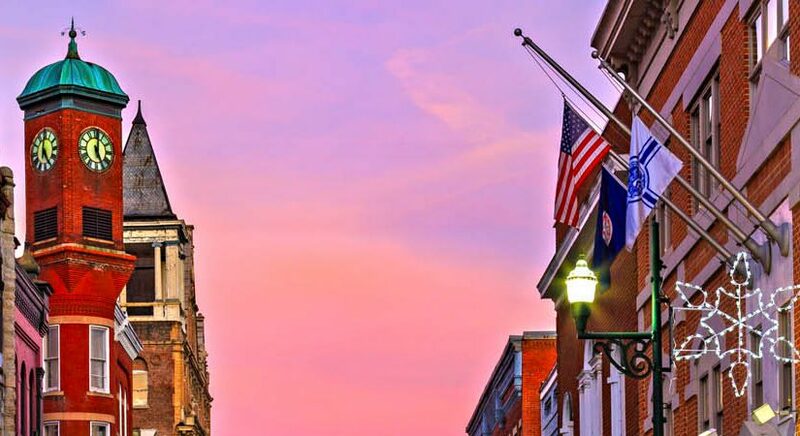 Staunton, Virginia is a beautiful place in any season, but if you’re looking for our favorite locations, we’ve chosen our five most photogenic. They’re perfect for family photos, selfies, and even architectural or scenic beauty. For a while, Sears Hill Bridge was gone. Literally, it was removed and placed in storage until funds could be raised to restore it. In 2013, a restored Sears Hill Bridge was reinstalled, once more providing a vital passageway for residents of Sears Hill to reach downtown Staunton. While the 1902 train station is not the original station in The Wharf District (it’s the third), it’s obviously a historic attraction and transportation hub. It would be easy to overlook this bit of nostalgia when considering photo ops, but you’d be remiss. A variety of portraits are staged here in every season, and if you time your photos to coincide with Amtrak arrivals and departures, you’d capture even more intriguing photos. As you walk the avenue of trees from Johnson Street to Byers Street, you’re likely to whisper, “wow.” Don’t worry, we do, too. There’s something so beautiful about a lane of trees shadowing a sidewalk. You’re likely to also appreciate how tucked away and quaint the shops ahead of you are, and how nice it would be to sit and enjoy a drink on the patio. Take it all and capture a few photos so you won’t forget. Located in Stuart Addition Historic District, Mary Baldwin University is one of the most picturesque places in Staunton. Some of the more notable locations for photos are the Lyda B. Hunt Dining Hall with its soaring columns, the Rose Terrace in front of Flora McElwee Miller Chapel, and Spencer Residence Hall with its mature trees, archways, and semi-circular portico with iron railing. Somewhere on the 214 acres of Gypsy Hill Park you’re going to find a gorgeous location for a picnic and photos. Our favorites are the Bandstand and Lake Tams, a 2.5-acre storm water retention pond that beautifully reflects the surroundings. Show us your best photos taken at any of these locations or share with us your favorite spot. We would love to share them and help you show them off! Be sure to include the hashtag #ScenicStaunton to get our attention. 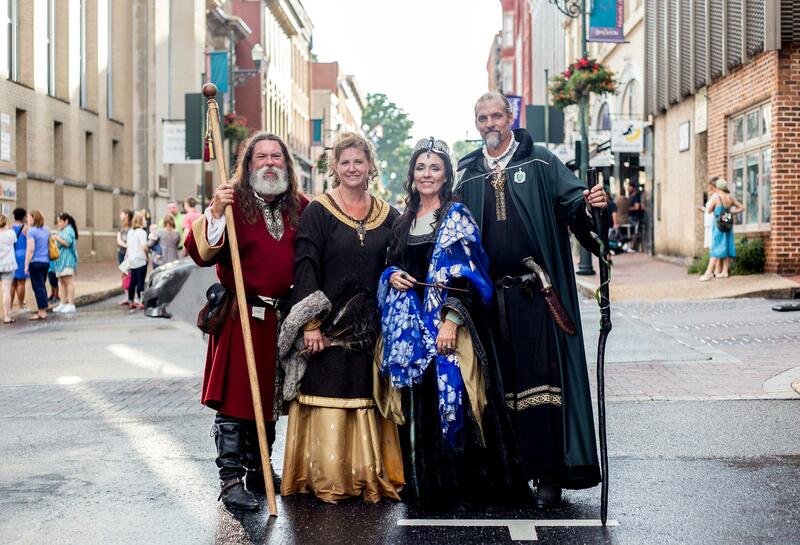 Staunton is a hub of creative activity with a variety of media and arts unveiled daily. Our hardworking artisans are nose-to-the-grind as they amass beautiful handmade wares for the home, to be gifted, worn, and treasured. Nearly every downtown block hosts a passionate creator. Take the time to see their work, see them at work, and possibly fall in love with something their hands have made with these four mandatory stops for arts and crafts in Staunton. Fiber artists Lisa Jacenich creates hand-felted wool and silk clothing, and re-purposes old wool sweaters to create scarves and mittens. Her clothing includes the usual suspects as well as some surprising pieces, like a little black dress! Lisa’s husband Jim is her detail-oriented accessory partner. His specialty is kumihimo, or, Japanese braiding, which he applies to belt and jewelry making. The Jaceniches consider their work to be wearable art. 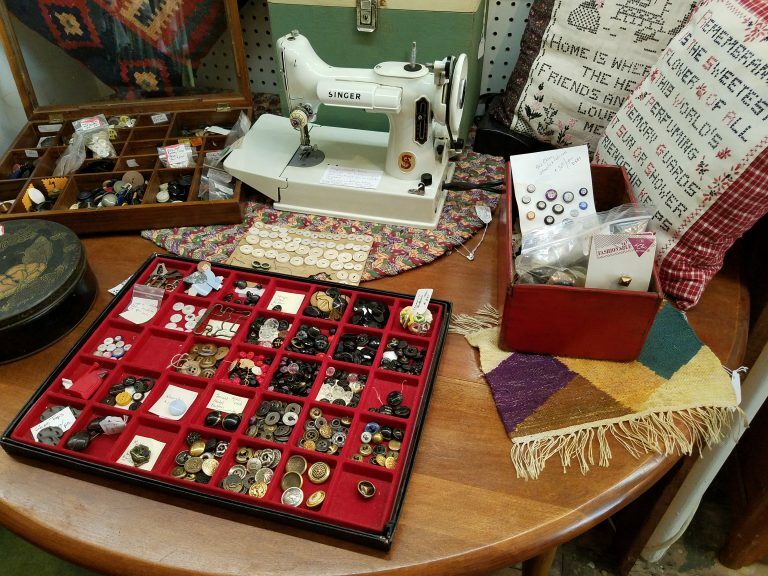 From simply embellishing existing clothing to creating their own clothes, accessories, and jewelry, one can complete an entire outfit at Artful Gifts. If you care to learn how to create the types of items the Jaceniches create, you’re in luck. Workshops are available! Laurie Gundersen is a “utilitarian folk artist” and the driving force behind Appalachian Piecework. Her talents include basket weaving, fabric dying, quilting, and spinning. From her 18th century barn loom she crafts handwoven market bags. From locally-harvested trees she weaves a variety of baskets. Not even the bark is wasted. Appalachian Piecework also offers handcrafted products by like-minded artisans. Stop by to shop Thursday through Saturday from 11 to 6. Restoration requests and custom orders are welcome. A hub of hot air and gorgeous glass gifts, Sunspots Studios & Glassblowing is owned by Doug and Caroline Sheridan. Doug was a metal artist who picked up glass artistry rather accidentally, but who has created one of Staunton’s most interesting tourist attractions. Open every day of the week, would-be artisans can blow their own glass ornaments or just sit back and watch the Sunspots staff create beautiful pieces. Sunspots hosts the Virginia Hot Glass Festival each May, an occasion that includes additional artisans demonstrating their talents as well. In fact, a fire-breathing dragon is a regular attendee to the festival. 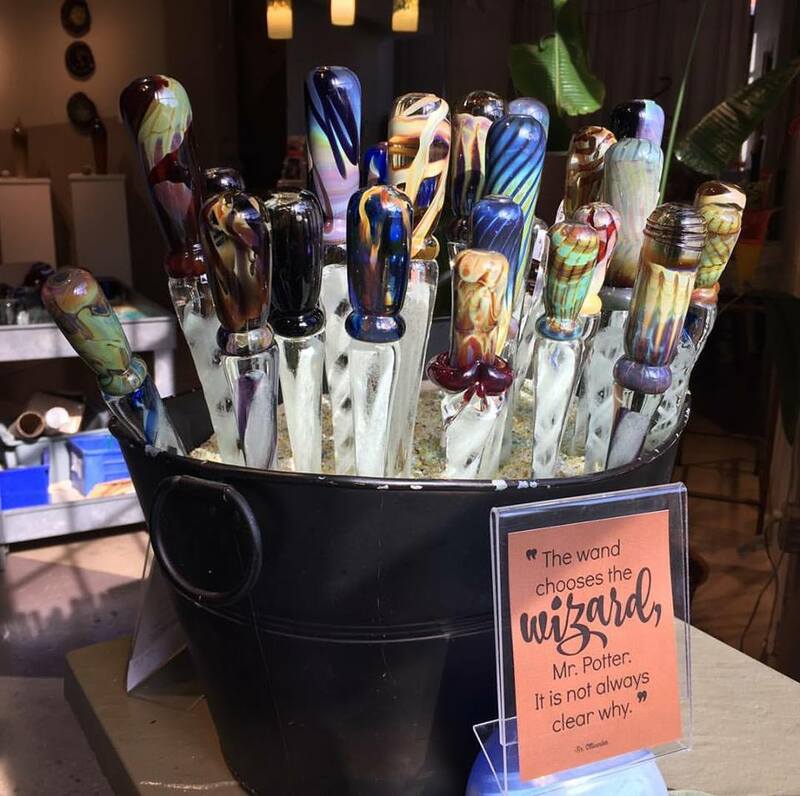 During the Queen City Mischief & Magic event in September, Sunspots’ staff created glass wizard wands. Truly, there may not be anything they can’t make. Stop in to Sunspots Monday through Saturday from 10 to 6 or Sunday from 11:30 to 5 to shop the gallery of 15+ artisans’ goods, catch a demonstration, or blow your own glass ornament. Rachel’s Quilt Patch is a fabric shop named for owner Rachel Brown. Both she and her daughter Kay Shirey are avid quilters and work the shop together. At Rachel’s Quilt Patch beginning quilters are introduced to fabric options, stitching, and more. Classes, workshops, clubs, and even “sew-in’s” are all options at Rachel’s Quilt Patch. Store hours are Tuesday through Saturday, 10 to 5, or by appointment Thursday evenings. Antiquing is almost like treasure hunting, except there’s no map with an “x” because the “x” is different for everyone. 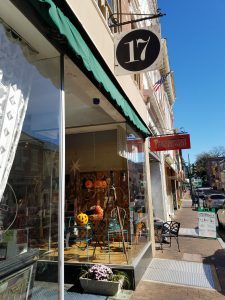 Fortunately, there are eight places to antique in and around Staunton, and we feel confident you’ll find a special something in one of them. From funky finds to recycled riches and everything in between, spend the day (or weekend) seeking out treasures of your own. There are no dusty items at L. Oppelman, rather, you’ll find only the finest pieces in this shop specializing in period and modern firearms, jewelry, silver, coins, and collectibles. Estate and vintage finds are beautifully displayed; sellers are as welcome here as buyers. If you have a thing for the ol’ tick-tock, Once Upon a Time Clock Shop is your place! Mantel clocks, wall clocks, grandfather clocks, European clocks, and Made in the USA clocks are all available here. If you have one that is in need of cleaning or repair, Dean Sarnelle is your man. His talents and abilities are renowned, thus clocks from around the country flood into his shop year ’round. Seven shops in one, 17 E. Beverley Antiques offers most of what you’d expect to find in an antiques store, but you may also find some interesting rarities, like sheet music and mid-century pin-ups. Vintage Christmas ornaments, silver, toys, and an array of vintage costumes are quite the draw. If you go, try on all the cool shades and take selfies. We want to see ’em! Discover upcycled treasures at Cherish Every Moment. 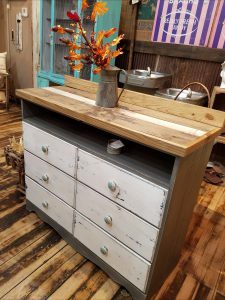 Vintage and antique pieces are made new again with a fresh coat of paint, hardware and personal touches to create an unexpectedly wonderful general store-meets-boutique destination. From rustic to somewhat Victorian, you’ll find a wide range of decor here. 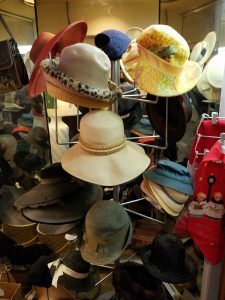 Vintage clothing, handbags, and jewelry share 10,000 square feet of space with antique furnishings, decor, table settings, art, lamps, and so much more. 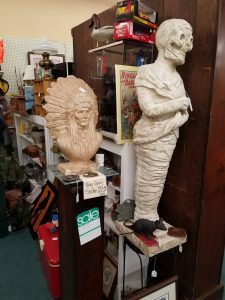 You’ll want to allow yourself plenty of time to notice every nook and cranny at Staunton Antiques Center, lest you miss a treasure you may not have known you needed. DO check out the incredible book selection. Three floors of vendor space are waiting for you at Queen City Marketplace. Browse to find an abundance of fine antique furnishings, heirloom quality linens, art, decor, toys, dinnerware, retro kitchenware, and folk art. Collectibles are tucked in for the sharp eye to find, so look closely for Longaberger, Department 56, comics, and more. 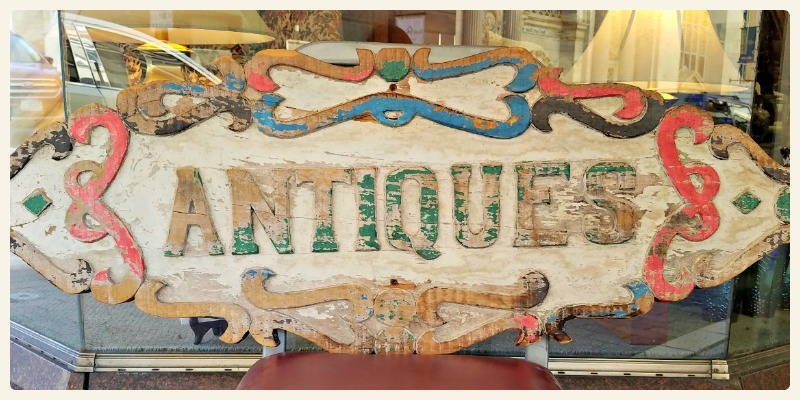 The odds are in your favor of finding something special at Warehouse Antiques & Collectibles. They’re loaded with many household items, decor, tools, glassware, woodcrafts, and needful things. Crocks, canes, enameled steel campfire necessities, baskets … the list goes on and on! Chef Said Rhafiri’s pan-seared maple leaf duck breast at Aioli is served with butternut squash parmesan risotto, vegetable tempura, and blackberry reduction. It’s one of the finer meals you can enjoy in downtown Staunton this fall. We’ve come to know that many travelers make their way to Staunton just to eat. Yes, our meals are THAT good. One of their destinations is The Shack, where Chef Ian Boden is inspired to create daily menus based on what the growers are delivering. Watch for delightful treats like Rappahannock oysters, pumpkin pierogi, and apple fry pie! A name like “Harvest Rigatoni” says it all. At Byers Street Bistro, you can order up this savory dish that includes sweet Italian sausage, roasted Brussels sprouts, butternut squash, fried sage, parmesan cheese, and a garlic white wine sauce. Cast iron cornbread is a southern staple and Zynodoa pairs it with house-made Gala apple butter. That’s just one of the special entries you’ll find on their ever-changing menu. You may also want to try the mixed green salad topped with Malcolm’s Market radishes, cucumbers, butternut squash, toasted almonds, Wayside Farm ginger, and herb vinaigrette. 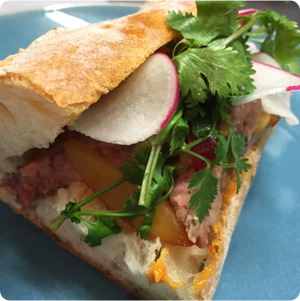 We’re always amazed at the ingenuity and think-outside-the-boxedness of Chef Mike Lund of Mike Lund Food & LunDch. You never know what incredible dish he will whip up, like maybe giant fennel-spiced garbanzo balls with spaghetti squash covered in herb marinara and shaved parmesan? It’s a veggie, gluten-free option that capitalizes on the season. And it’s delicious! If you love donuts, Paradise Donuts has to be on your list. Apple spice and caramel apple flavors are already rolling out, and maple is one of the all-time best sellers. 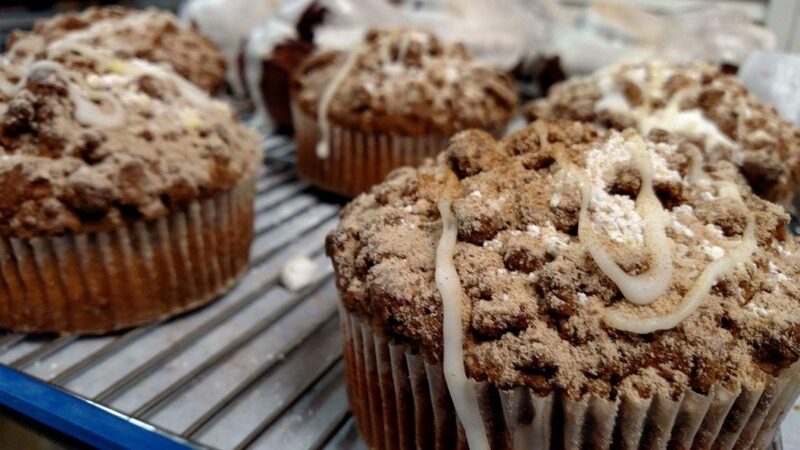 New for this year are pumpkin spice muffins. You’ll want to arrive early to ensure you score one of these tasty seasonal treats! Moriarty Day is one for your calendar. It’s the day Redbeard Brewing Company releases their latest edition of Moriarty, a barrel-aged Imperial Stout. This year’s Moriarty Day is October 18, and this year’s pour has been settling in Bourbon barrels from John J. Bowman, Eagle Rare, and Buffalo Trace. It’s no surprise that Staunton pulls off a flawless transformation to become the quaint wizarding hamlet of Hogsmeade in September. What may be a surprise is that Shenandoah Valley Brewing Company is tapping their Mischief Butterscotch Ale to coincide with the Queen City Mischief and Magic weekend (previously known as Queen City Potter Party … as in Harry Potter). Queen City Brewing has two delicious beverages that are perfect for the fall season. Try the hard-pressed Apple Ale or Cranberry Ale, both 7% ABV, and both quite refreshing. Fall flavored coffee and pastries are likely found in several of our favorite morning hot spots, but we like The By & By for their surprises like pumpkin rolls, peanut butter pie, and of course, their Oktoberfest celebration of craft beer and brats. Prost! Eat well and enjoy the autumn season in Staunton and the Shenandoah Valley! If you’re headed to the Shenandoah Valley for a JMU, VMI, or perhaps even a UVA football game this fall, consider staying in Staunton. We’re a short and scenic drive to nearby gridirons, and a hip, historic overnight, too! Avoid the crowds and stay at one of our accommodations, which are more likely to have availability than the host cities. In downtown, choose from the Stonewall Jackson Hotel, The Bard’s Nest, and The Storefront, all within walking distance of tasty food and beverages. For those early tailgaters the Comfort Inn is a great option with easy access to Interstates 64 & 81. Pregame with a filling breakfast at The By & By, Blue Mountain Coffees, or Kathy’s, then head over to Gypsy Hill Park for a warm-up and stretch. Walk the trails, feed the ducks, and let the kids run off a little bit of energy before it’s time to tailgate. Gypsy Hill is also an excellent place to land after the game. Perhaps a post-game picnic? 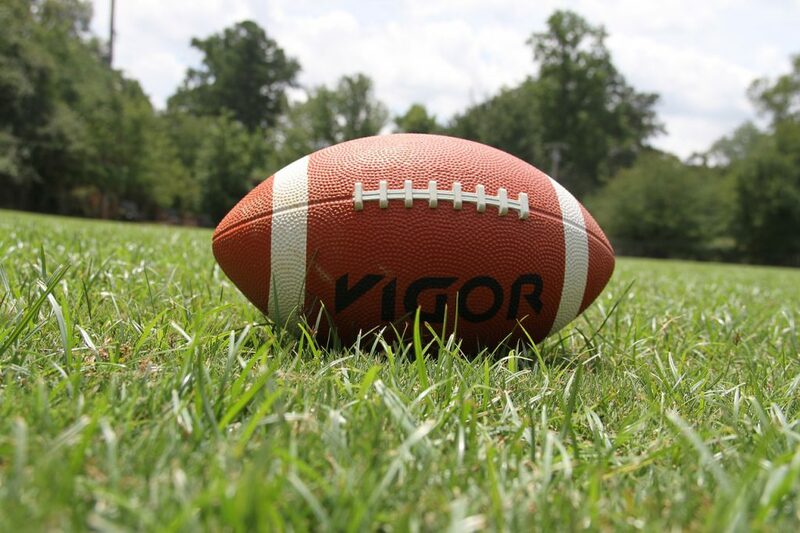 Speaking of tailgating, you’ll need to stock up before you head off to the game. Pick up a tasty variety of salads, pastas, and sandwiches from Farmhouse Kitchen & Wares, Pampered Palate or Cranberry’s. All of which offer fresh, homemade eats that can easily be taken on the road. To quench your thirst, pick-up a six-pack of local craft beer at Shenandoah Hops or maybe some Virginia wine at The Wine Cellar. Celebrate your victory at one of our craft breweries or lively restaurants, like Baja Bean Co., Shenandoah Pizza, or Byers Street Bistro. If your team wins, you’ll want to be close to your accommodation before you start celebrating. Should your team lose (gasp! ), blow off some steam with your own hot air by blowing glass at Sunspots Studios. Go Dukes, Hoos, and Keydets! We wish you a successful, winning season! Calling all muggles and wizards! The second annual Queen City Potter Party (now Queen City Mischief and Magic) is September 22-24, and unless you attended the 2016 party, you’ve never seen Staunton like this. Three days of mischief and magic await! As Staunton is transformed to Hogsmeade (the only wizards-only village in Britain, per the Harry Potter series), business names change, the culture changes, and food and drinks change. It’s as if our city is charmed for the weekend! To find your way around, you’ll use a Marauder’s Map, much like Harry did during his first visit to Hogsmeade. Fortunately, you won’t need your invisibility cloak. Get the weekend started with the Hogwarts Homecoming Quidditch Games on Friday. The first match will be between Hufflepuff and Ravenclaw at 6 p.m. Late arrival? You’ll have Gryffindor vs. Slytherin at 7 p.m. The championship game begins at 8 p.m.
See Harry and Hagrid arrive via the Hogwarts Express at Platform 9 3/4 at 9 a.m. Saturday! Visit the conductor and get a hat just like his while supplies last. Choose your wand. Rather, let a wand choose you! Purchase wooden wands at Weasley’s Wizard Wheezes (Pufferbellies Toys & Books) or glass wands at Ollivanders Wands & Orbs (Sunspots Studios). Want to eat your wand? Head over to ye Olde Curiosity Shoppe (Staunton Antique Center & The Artisans Loft). Craft a potion at Borgin & Burkes (Redwood & Co.), but sign up fast as we are certain the classes will fill quickly. Is Amortentia on the list of potions to be made? That would be lovely, wouldn’t it? While no one wants to be a “prisoner of Azkaban,” you should head over there anytime between noon and 6 p.m. Saturday (Cocoa Mill Chocolate Co.). Beware Dementors. Just sayin’. The Ministry of Magic Tours are limited, but must-see! Secure your time slot to take a special family-friendly tour through Crack the Code Escape Room before they’re gone. Madam Puddifoot’s (The Pampered Palate Cafe) is not only a Hogsmeade destination for delicious eats and drinks, there are classes to create your own Magic Twirling Tea Cup upstairs! Text 434-826-0832 to reserve your time slot. Professor Gilderoy Lockhart will be available for a meet-and-greet at Flourish & Blotts (Black Swan Books and Music). Do purchase a Queen City Mischief and Magic tote to carry all of those potions and tea cups! Visit the Restricted Room at Hogwarts Library (Barrister Books), but head’s up! There are flying books! Be sure to add a quill or bookmark to your QCMM tote. Try your hand at taming beasts (some of them are indeed fantastical!) at Magickal Menagerie (Harmony Moon). Wizards beyond a certain age will want to seek out the butterbeer at The Three Broomsticks (Baja Bean). Cheers! Find your way to The Flaming Arena behind Gringotts (Suntrust Bank) Friday and Saturday night. The Queen City Fire Circus will be performing a free show. 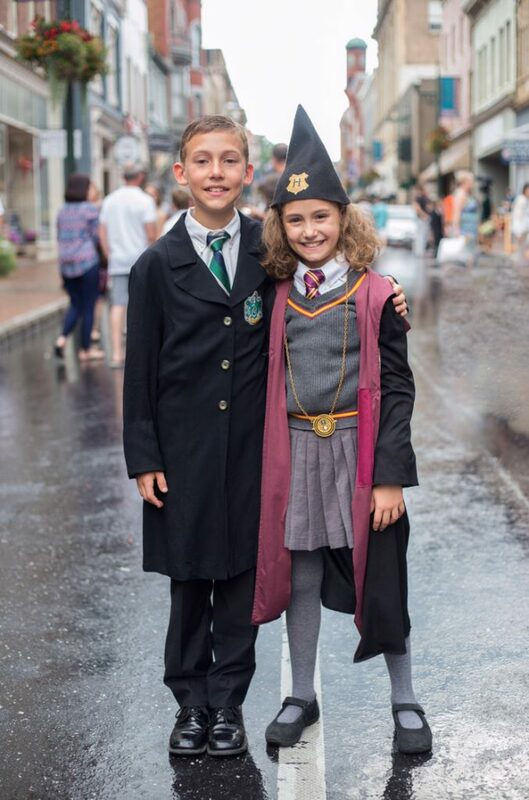 Channel your inner Hermione with a visit to Beauxbatons Academy (Mary Baldwin University) for a magical lesson on a variety of Potter-related topics, from owls to Nicholas Flamel. Taught by Mary Baldwin professors and other community experts. … and that’s just the beginning! The Marauder’s Map is LOADED with fun in Hogsmeade. Check often for its availability and updates. You won’t want to miss a thing! There is limited parking available downtown: side streets, public lots, two parking garages (on Johnson Street and New Street). Please view this map that shows all public parking: Map of downtown Staunton. ​There will also be a FREE shuttle running a constant circuit from the Federated Auto Parts Warehouse lot (on Statler Blvd) to the Mill Street Grill parking lot. For a map click link. Download Traipse, an app, to participate in Horcrux Hunting. Keep an eye on the schedule for late additions. You are encouraged to dress as your favorite Harry Potter series character. See the photos from 2016 for inspiration. Queen City Mischief and Magic is a FREE event with a few pay-as-you-go opportunities (like crafting your own Thinking Putty at Weasley’s Wizard Wheezes!). The smells from food trucks on city streets are always so enticing, aren’t they? Think of a field full of food trucks. Now consider that they’re truly bringing their “A game” because such a gathering could only mean one thing: competition. Now in its third year, The Virginia Food Truck Battle & Beer Competition will be held Sunday, September 3rd to benefit The Madee Project, a local non-profit foundation providing support to families facing their own battle: pediatric cancer. The event has grown with more food trucks than before vying for Grand Champion status. They cook well, you eat well, and The Madee Project benefits well. It’s a win-win-win. Food trucks from across the Commonwealth are split into three zones. VIP ticket holders act as the judges and receive a sample of each truck’s cuisine (six total per zone) and a sample from each of the six breweries in the beer garden. VIPs cast their votes and a winner from each zone plus one brewery is proclaimed. The three zone winners then deliver their wares to a panel of judges who name a Grand Champion food truck. VIPs enter at 11:30 am before the general admission ticket holders are permitted access at 12:30 p.m.
General admission tickets provide entry to the Frontier Culture Museum and access to entertainment and children’s activities. Trucks, breweries, and wineries are essentially vendors for a la carte purchases starting at 12:30 pm. These are the known contenders as of this writing. What isn’t known is which trucks will be in which zones until the day of the event. Oh, the suspense! Rock’s Money Pit BBQ- Augusta Co.
El Chilango Mexican Grill – Nelson Co. Need cash? There’s a Farmers & Merchants Bank mobile ATM on site. Have creative kids? Let them PAINT A CAR, courtesy of Valley Cars! Magic Shows and Freckles & Friends will be performing. Along with several games to take part in! Is the phone going dead? There’s a charging station, courtesy of Cricket Wireless. Not much of a craft beer fan? Coors Lite will be available for purchase. Not a beer fan at all? Ox-Eye and Rockbridge Vineyards will be pouring their wines by the glass as well as selling bottles. Love selfies and capturing the moment? There’s a hashtag for that: #VAFoodTruckBattle. Celebrate entrepreneurship, ingenuity, perseverance, love of place, and so much more when you celebrate Virginia Craft Beer month with us in Staunton. Staunton’s newest brewery has become a favorite on the local circuit, and it may be thanks to not only a new variety of craft beer flavors, but also the wood-fired pizza! There’s more than just excellent pizza and an umbrella-filled patio. Come for the brunch, unexpected delights like seafood and poutin, and of course, live music every now and again. Feel free to bring your pooch. The patio is dog-friendly. Bring your own food or have something delivered to you at the brewery, as food is not served. Live music, however, is. Watch the calendar. Many craft brewers are happy to share some of their knowledge and help others along, but the folks at Shenandoah Valley Brewing Company take that generous spirit a step farther by offering homebrewing supplies as well. Craft your own flight to see which of their beers you favor, and then take a stab and brewing your own. There are no food options on site but you’re welcome to bring your own or order from the Farmhouse Restaurant on Fridays and Saturdays. Happy brewing! Thirty-two taps could be overwhelming to some, but we would suggest you try a flight (or two or three) to figure out which of Queen City’s “on tap” varieties will be your favorites. With more than 80 recipes to pull from, you can expect a healthy rotation of options pretty regularly. Homemade soda, fruit wines, and hard-pressed apple ale are also available. If you’d like to try your hand at the brewing process, ask to become the brewer. Like Redbeard, food is not available, but you’re welcome to bring your own or order-in. A food truck is on-site every Friday, and live music rings out every Wednesday and Friday night. Our four breweries are just a tip of the Beerwerks Trail. Hop on over to Waynesboro, south to Lexington, and north to Harrisonburg for 10 more. We’re a convenient location to hub-and-spoke your way along the trail and try all of the breweries in a long weekend. See the map. Freshly stocked cooler! Come build ya a 6-pack. We're open until 4:00! After you’ve tried our breweries, visit Shenandoah Hops to taste more Virginia craft beer and wine. Friday tastings are complimentary, and the knowledgeable staff can help you find something perfect for your palate. They’ll also fill any growler, so stock up!